This is the first Comeback Player of the Year Award officially sanctioned by Major League Baseball, which will be presented annually to one player in each League. The Comeback Player of the Year Award recognizes the players who have re-emerged on the baseball field during a given season. Representatives of Major League Baseball and the editorial staff at MLB.com, the official Web site of Major League Baseball select the nominees, six players from each League, for the Major League Baseball Comeback Player of the Year Award. Those nominees are then featured on MLB.com where fans of the game can vote for who they believe best deserves the award. To further engage fans in the selection process during its inaugural year (2005), Pfizer, maker of Viagra ® (sildenafil citrate) introduced an online sweepstakes in conjunction with the Major League Baseball Comeback Player of the Year Award Presented. As part of the program, one lucky sweepstakes winner threw out a ceremonial first pitch in the 2005 World Series! The American League winner of the 2005 Comeback Player of the Year Award, Jason Giambi , said during a phone interview, "I'm speechless. I'm definitely honored. It's been a lot of hard work and a long road. It's definitely been the most challenging season, no doubt about it. Even more than being a rookie, when you don't know what to expect. I didn't know what to expect this year after being sick and everything, because New York is a tough town to come back in. To do this in New York makes it even more special." Did you know that Francisco Liriano was the first player to ever to win the Comeback Player of the Year Award twice during his Major League career? He is also the first player to ever win it once from each league as he earned it first in 2010, in the National League, then in 2013, in the American League! 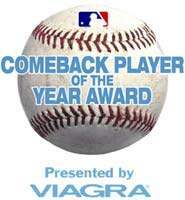 This is the first comeback player of the year award officially sanctioned by Major League Baseball and during it's debut season (2005), more than 400,000+ people took part in the voting process. Pfizer, maker of Viagra ® and the official sponsor from 2005 through 2009, gave one lucky sweepstakes winner the opportunity to throw out a ceremonial first pitch prior to a 2005 World Series game.